Manage both your Google Calendar and Zoho Calendar in one space by using the sync feature provided in Zoho Calendar. 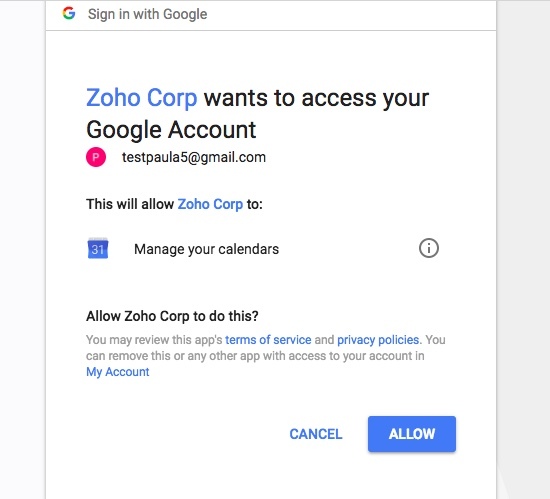 Google Calendar sync allows you to synchronize your Google Calendar with your Zoho Calendar, from where you can add/edit/delete events in Google Calendar. You can manage both the calendars together with ease and schedule events perfectly without having to jump between tabs. 2. Go to Settings > Calendar > Synchronize. 3. Click on Google Calendar. 5. 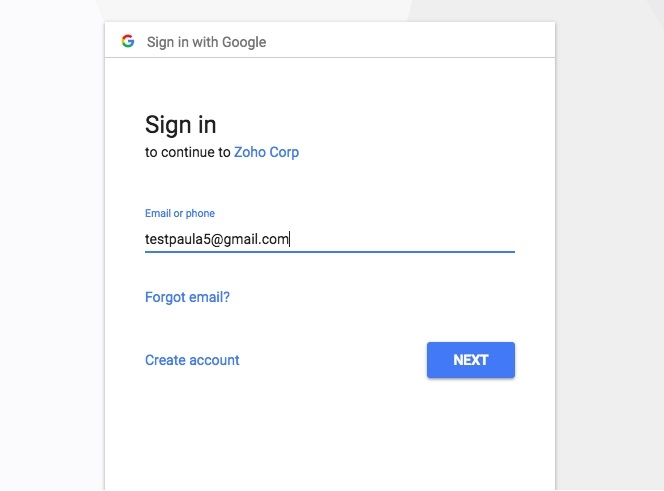 In the authentication window, enter your Google account credentials and login. 6. Click on Allow and proceed with the authentication. 7. After the authentication is complete, you can click on Synchronize to start the synchronization. 8. Once the Unsynchronize button appears, the sync becomes complete. 9. Refresh your calendar and the events will be updated. Disable the pop-up blocker in your browser before starting the Google Calendar sync. Whenever changes are made to an event, a delay of up to 5 mins is observed for the changes to be reflected on both the calendars. Google Calendar will be available under "App Calendars". Only the primary calendar in Google Calendar can be synced with Zoho Calendar. To add events to your Google Calendar from Zoho Calendar, you need to choose "Google Calendar" from the Calendar drop down section in the "Create event" window. 4. Click on Unsynchronize to stop the synchronization. Once you stop the synchronization of Google Calendar with Zoho Calendar, the events will be removed from the Zoho Calendar. While adding events to Zoho Calendar, if you find that the events are not being synced with Google Calendar then you need to select the calendar as "Google Calendar" in the Create Event window while adding an event. There might be a slight delay for the event to reflect on Google Calendar. Refresh after some time and the event will be added. You might observe that when you have clicked on Google Calendar sync, your sync is not enabled. This happens when you have disabled the pop-ups in your browser. Once you have enabled the pop-ups in your browser, click on "Google Calendar" sync. Enter the credentials in the authentication window to proceed with the sync further.